Learn how to make delicious and nourishing turmeric golden milk with just a few simple pantry ingredients plus plant-based milk of your choice. Homemade golden milk has wonderful anti-inflammatory and antioxidant properties and makes a nice alternative to tea and coffee. Enjoy as a warm, cozy drink on a chilly day. It can also be enjoyed cold. Add the turmeric, black pepper and other optional spices and sweetener to a blender. Heat your milk either in a small saucepan stovetop or in the microwave. Once it’s hot, add to the blender with the other ingredients and blend on high for 20-30 seconds until smooth and foamy. Pour into a mug and enjoy. Alternatively, you can blend everything first then heat the golden milk on the stovetop. Both methods work well. If you used fresh turmeric root or ginger root, I would recommend straining through a mesh sieve or nut milk bag before drinking. To make golden milk on the stovetop, add all the ingredients to a small saucepan and heat over medium heat while whisking until steaming and frothy. You can use an electric milk frother for extra froth. If you used fresh turmeric root or ginger root, consider straining through a mesh sieve or nut milk bag before drinking, otherwise, pour into a mug and enjoy. To make iced golden milk, either use the blender method but skip the heating or simply add the spices and sweetener to a glass with a splash of water and mix into a paste then stir in cold dairy-free milk of choice and ice cubes, if desired. 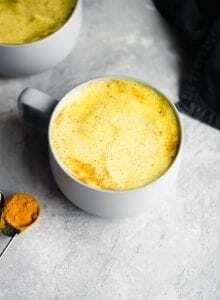 I like my golden turmeric milk thick and creamy but if you prefer it to be more like tea, you can add up to 2 cups of milk, or 1 cup of milk and 1 cup of water and gently simmer for about 10-15 minutes. To make a golden milk chai tea latte, brew a mug of chai tea then top with blended golden milk. Alternatively, you can add a chai tea bag and some extra water to the golden milk as it heats. This recipe can be doubled or tripled as needed. Any leftovers can be stored in the fridge and reheated as needed.